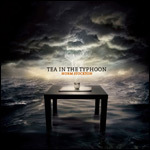 Eight years removed from Pondering The Sushi, his acclaimed debut as a solo artist, Norm Stockton released his second independent production, Tea In The Typhoon. Spanning jazz, fusion, funk, rock, classical, and West African influences, Stockton's latest session features performances by John Patitucci, Michael Manring, Etienne Mbappe, Gregg Bissonette, Lincoln Brewster, and many other outstanding guest artists. With nearly seven hours of instruction covering fundamental concepts to many of the most advanced techniques utilized in the vocabulary of contemporary bass playing, Stockton's Grooving For Heaven video series is recognized as an indispensable resource for any dedicated bassist looking to take their grooving ability to the next level. 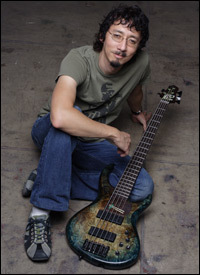 Along with his instructional videos and Grooving For Heaven clinics, Stockton's credits as an educator include serving as adjunct faculty at numerous universities and music schools such as Concordia University, Hope International University, Biola University, The Los Angeles Music Academy, and also authoring three levels of groove curriculum at MusicDojo. As a leader, sideman, and clinician for MTD, Gallien-Krueger, and Maranatha! Music, Stockton has toured extensively throughout North America and abroad in locations from Europe to Japan. 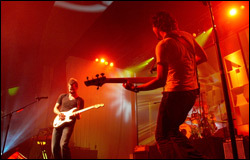 Since 2006, he has been recording and performing with chart-topping worship artist Lincoln Brewster. In this interview, Stockton discusses Tea In The Typhoon, working with Lincoln Brewster, his instructional videos, developing grooves, teaching at MusicDojo, why he still prefers the taste of Coke to that of Pepsi, and much more! Considering your debut as a solo artist, Pondering The Sushi, was issued in 2001, what kind of projects have been keeping you busy over the past nine years? Wow, I can't believe it's been that long. It's definitely been a busy nine years! Since the release of Pondering, I've completed the third and fourth volumes of my instructional DVD series, The Art Of Groove and Pondering Bass Technique. I recorded A Dangerously Groovy Christmas with the Outtengrand Orchestra and my wife, Gina Stockton's, solo debut CD, All That I Can Bring. I wrote three courses for MusicDojo. 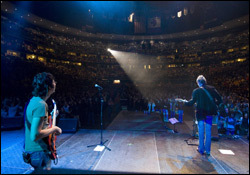 Additionally, in late 2006, I started recording and touring with worship artist and former Steve Perry guitarist, Lincoln Brewster. I played on both his "best of" CD and his latest release, Today Is The Day. We're presently working on his next studio project which is slated for release in September. In the midst of all of these projects, I've also fit in as many clinics as I have been able to as well as a few dates with The Norm Stockton Group including a short run in Japan in 2005. Could you tell us about your latest production as a leader, Tea In The Typhoon? The Typhoon project was both an absolute blast and incredibly hard work. I imagine that the same could be said for many recording projects. For me, it's a challenge just to find the time to get it done in the midst of road work, sessions, and trying to be present and engaged with my family through the process. Stylistically, the new CD is related to the Pondering project, contemporary jazz/funk, while also covering some new musical territory. Most notably is that I've become a fan of West African music. That whole 6-over-4 thing is amazing. Particularly in terms of rhythms, a handful of Typhoon tunes are definitely influenced by what I love about that music. Of course, I'm a half-Japanese guy living in Southern California so it's probably more accurate to describe it as "Norm's version of Cameroon-by-way-of-L.A.!" One of the coolest aspects of this project was the opportunity to bring in some of my absolute favorite musicians to contribute, and they were all simply stellar. Featured guest artists include John Patitucci and his cellist wife Sachi, Michael Manring, Etienne Mbappe, Gregg Bissonette, Lincoln Brewster, Tony Guerrero, and Rob Mullins, in addition to my core musicians who are also successful, world-class players in their own right. The project was tracked using Pro Tools. I run an HD rig at my home studio, Gracecase Studios, and tracked all of the basses, percussion, and most of the horns there. For interested gear heads, I tracked my basses directly into an API A2D mic pre with digital out to the Mac Pro. Drums and grand piano, except Rob Mullins' piano solos, were tracked at Signature Sound in San Diego. The remainder of the sessions were done remotely in home studios around California as well as in Kansas City and New York. I was present at all of those sessions except Etienne Mbappe's in Paris. I just couldn't break free long enough to make the trip. What was it like producing all of the guest artists appearing on the new recording including John Patitucci, Michael Manring, and Etienne Mbappe? There was something very strange about sitting in the producer's chair and listening to them doing takes! It took some focus to keep my mind from constantly drifting to "hey Norm, don't know if you noticed this, but that's JOHN PATITUCCI bowing his upright on one of your tunes." I was blown away by how gracious and committed to the music all of these players were. The charts were standard rhythm charts created using Sibelius notation software so they reflected melodies as applicable and any necessary rhythmic figures. All of the rest was improvised within the context of the changes. All of the basses were tracked direct using the player's normal signal path, with the exception of John's upright. Doug Epstein, an engineer with whom John has done a lot of work in the past, used a Violet Globe mic placed several feet away and slightly off-center from the body as well as a pair of mics in an X/Y pattern approximately a foot from the bridge. How has your playing evolved since the release of Pondering The Sushi? I hope that I've continued to improve! It's hard for me to say definitively because the process is so gradual. I do feel that I've matured in terms of the harmonic side. I've most assuredly not arrived at my final destination yet, but I know that it is more together today than it was in 2001. The area of my musicianship that I can confidently say has evolved significantly is the writing and arranging side. There are lots of things on the Typhoon project that weren't in my compositional bag eight years ago. How did the gig with Lincoln Brewster come about? We first played together at a worship conference in Seattle back in 2003. It was a spontaneous jam type of situation with Lincoln, me, and a drummer named Will Denton (DC Talk, LeAnn Rimes). We had a blast and it went over really well. Lincoln and I would bump into each other once or twice a year at various events until the middle of 2006 when his regular bassist, who was on staff at Lincoln's church in Sacramento, was going out of town and I got called to sub. I filled in for another few dates that year until that bass player announced that he was moving to Nashville with his band. Linc contacted me and asked if I was available to take as many dates as I could accommodate. I've been working with him ever since. What is a typical day like on the road with Lincoln Brewster? I don't know that there really is a typical day as things fluctuate depending upon the type of event, concert/festival/church services/radio promo event, and how many time zones we crossed to get there. Generally, we fly in the night before, go out to dinner and possibly load in, and get a line check at the venue before heading to the hotel. The next morning, we'll make a coffee run and head to the venue for soundcheck. Most of our dates are fly dates and not bus tours so each of us wears several hats due to the absence of a big road crew. After getting my bass gear ready to go, I'll usually assist with getting mics up, helping setup the merch table, and so forth. After we play, we usually try to tear down and load out in time to make it to a good local restaurant and grab a late dinner before heading back to the hotel. Everyone in the band gets along well so the meal hangs are always fun. Plus, we're all fans of good food so we tend to track down great local fare whenever possible. Do you have the opportunity to do any featured solo playing during live shows? Yes, at probably two-thirds of the events we play, there will be a bass solo at some point in the evening. It's usually subject to how long of a set we're playing and the overall context of the event. What gear do you use on tour? The bass I use for my work with Lincoln is an MTD J5 prototype. It's the cherry sunburst bass that you might have seen in various pictures of me in recent years. My live signal path with Linc is currently bass into tuner into SansAmp. The SansAmp goes directly to the front of house with a parallel out to my stage rig which is usually a Gallien-Krueger rig provided by the backline company. For large festivals, it's usually a GK 2001RB head and a Neo 412 cabinet. I love that rig for the big rock thing. That said, I'm in the midst of assembling a new signal chain. I'm looking for something highly portable and that can give the requisite hairy and compressed rock tone with consistency from date-to-date and whether recording or live. I haven't landed on the specific gear yet, but it's a work in progress. Can you discuss the concepts you cover in the 4 volumes of your Grooving For Heaven instructional series? The first two volumes fill in the holes for most self-taught players and covers fingerboard familiarity, application of the modes, different styles of music, and what makes them that way rhythmically, harmonically and sonically, along with beginning to intermediate slap, and how to play a fill tastefully around a vocal line. It's about two and a half hours of material divided into two DVDs. Volume 3, The Art Of Groove picks up from where Volume 2 ends, and it is almost two hours of further exploration of the bass/drum relationship, much of which is shot with drummer David Owens. Lots of topics are covered including harmonic and rhythmic ear training as well as phrasing and feel such as the difference between rushing and dragging vs. playing on top or laying back. It illuminates many concepts from both sides of the drum riser which I feel is invaluable for playing together effectively. It concludes with a bunch of exercises to help bass players and drummers develop synergy together. It's been gratifying to hear from so many rhythm sections who have sat down and watched Volume 3 together and found it helpful. Volume 4, Pondering Bass Technique is the first of the series to focus on the pyrotechnic side of bass. People who had seen me in clinics or heard some of my solo work started asking which video covered all of the solo stuff including double-thumbing, tapping, chording, artificial harmonics, and solo bass arranging so Volume 4 is over two hours of detailed material covering all the stuff that will get you fired if your ensemble skills aren't together! Since you released, The Art Of Groove, an entire DVD dedicated to the subject of grooving, how did you develop your ability to groove? I think the most important factor was developing a passion for the groove. I came from a background where the emphasis was on playing lots of runs all the time. Through a perilous experience in a recording session many years ago, I came to the realization that none of the rest of it mattered if the time and feel weren't happening. My entire paradigm changed overnight. I developed a passion for the groove and began to think of the bass as part of the drum kit. Although there are so many cool things to be done with the bass harmonically and melodically, I became convinced that the rhythmic aspect was the highest priority. I started listening to lots of great rhythm sections and analytically evaluating what they were doing in terms of note choices, note duration, beat placement, and phrasing. If I heard a great groove, I'd dive in and try to figure out exactly what made it feel so great. I think once a player develops that groove-centric mindset, the rest naturally falls into place including emulating people who do it well, developing your vocabulary of grooves and ability to come up with the right part to support the tune, and working with a metronome. The latter is like eating your veggies, perhaps not as much fun as dessert but enormously beneficial. That said, I definitely don't feel that I'm done learning about how to groove. I am still, and always will be, a student of music. Are all of your instructional DVDs now being distributed through Alfred Publishing? Yes, the entire Grooving For Heaven DVD series is now being distributed by Alfred so they should soon be much easier to find in your local music store. They are also still available through NormStockton.com, various online retailers, and bass shops. All of the existing retailer relationships remain. Alfred is simply broadening availability with their vast global distribution network. I was introduced to Alfred through my great friend and stellar jazz bassist, Todd Johnson, who signed with Alfred about a year ago. I'm really excited to be working with them. It's been years since the videos had formal national distribution, and that is when Volumes 1 and 2 were still on VHS tapes. Everyone with whom I've dealt at Alfred has been great and seems to really know their business. How has the music industry changed over the years in terms of the way you now market your products? I feel like I got into the game towards the beginning of the worldwide migration to the internet so it hasn't changed as dramatically for me as it probably has for others. From the very beginning in the late '90s, I had a website with an online store. I certainly wasn't the first to dive in, but there weren't a ton of players out there doing that sort of thing yet. What I realized during the promotional and marketing push for the Typhoon project is that lots of print publications that were around at the time I released Pondering The Sushi are now either strictly online publications or have simply shut down. A few of the big magazines are still doing alright, but it's definitely a different world. I feel conflicted. On the one hand, I probably prefer the days where most people bought actual media including CDs and magazines, but on the other hand, the internet has played an indispensable role in allowing me to do what I've done over the years. The leveling of the playing field, so to speak, that the internet facilitated resulted in career viability for countless indie artists and arts-related endeavors around the world. The popularity of YouTube, FaceBook, and Twitter has really been a big factor, too. The kind of exposure that's afforded when a video clip is viewed 50,000+ times by people around the world is incredible, and it's absolutely free. The internet has downsides, to be sure, but it is amazing. My only challenge with YouTube is that people can get the wrong idea based upon the content that tends to become popular, usually the flashy stuff. I've read occasional comments from folks lamenting that my playing is too flashy and that they'd prefer a simple groove, not realizing that 99% of my time is spent doing just that, but those clips don't tend to be circulated nearly as broadly as the solo pieces. Where should people go to purchase your recordings and instructional videos? They are certainly welcome to purchase them directly from me at NormStockton.com. Otherwise, I'd definitely encourage folks to ask for the DVDs at their local music store. Any momentum that can be generated for Alfred's distribution only helps me to focus on being the best musician I can be versus running a DVD and CD distribution operation! The recordings are also available online through iTunes, CDBaby, and Amazon. Do you place an emphasis on any specific concepts or techniques during your clinics? Although I do incorporate some fun, solo-oriented playing in my clinics, the focus is almost exclusively on ensemble playing and groove concepts. I feel like it's the stuff I used to ignore when I was a younger player, only to realize its importance later down the road. If I can illuminate the need and inspire folks to develop a passion for grooving, I feel that the evening has been a success. Are there certain aspects of music and bass playing that you feel every bassist should study? Diatonic harmony, reading, ear training, and genre studies such as learning idioms of various styles of music are great places to start. Would you consider the ability to read standard notation and navigate charts as being an essential aspect of playing bass? They are most definitely essential aspects, particularly if you're looking to play music vocationally or get an opportunity to sub in different situations and broaden your musical horizons. Ironically, working with Linc is the only situation in which I've worked where there are no charts. All the music is memorized. I guess music stands aren't very rock and roll, but every other situation involves reading to some degree. Do you ever get burned out or stuck in a rut with your playing, and if so, what have you done to gain a fresh perspective? Yes, I definitely have. I've found it helpful in the past to take a little time away from playing or spend some time immersing myself in something creatively inspiring or rejuvenating. For me, that can be anything from sailing to watching The Flecktones' concert DVD, Live At The Quick, to studying unfamiliar styles of music, or any number of other things. As a Christian, my perspective regarding any musical abilities I possess is that they were and are a gift. I feel that it's my calling to cultivate them and continue to musically evolve to the glory of God. I try to be proactive about keeping musically inspired. Writing and tracking the Typhoon project was hugely helpful for me in that regard. I'm so grateful that both Tea In The Typhoon and Pondering The Sushi have resonated with so many people. Candidly though, as an artist, and I don't mean for this to sound as highbrowed as it probably does, I needed to do them as much for myself as for anyone. I believe the same applies to any creative person. Without an outlet for your creativity, whether economically profitable or otherwise, burnout and stagnation can make an easy target of you. Which courses do you teach at MusicDojo? I have three levels of groove curriculum called The Art Of Groove. 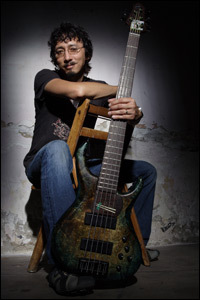 The first two courses lay the technique, theory, ear training, and conceptual groundwork for becoming a solid groove bassist. The third level focuses on musical styles and explores the rhythmic, harmonic, and sonic characteristics that define those styles. The feedback to those courses has been fantastic over the years, and I'm so grateful that so many players have found them beneficial for their musical growth. Is the curriculum contained in these classes similar to your instructional DVDs? There are similarities in the core material but with some tangible differences as well. The modes and their application are covered in more detail in the MusicDojo course, The Art of Groove - Level 1. That same Level 1 course also has a crash-course tutorial on how to navigate a basic rhythm chart. The Level 3 course covers musical styles more comprehensively than the DVDs, and most significantly, the MusicDojo format is interactive through use of freeware, allowing students to record and upload audio clips of themselves playing to the provided drum tracks for my feedback and suggestions. The Grooving DVDs are a resource with almost seven hours of one-on-one instruction with me demonstrating the various concepts, exercises, and examples. They are obviously very visual, more so than the MusicDojo courses, with lots of close-up fingerboard shots. I think it really boils down to your preferred learning style. In the liner notes of all your recordings and instructional videos, you have always maintained the position that Coke is a better soft drink than Pepsi, but given the fact that the majority of participants in a national blind taste test preferred the taste of Pepsi over Coca-Cola, why do you still, unequivocally, prefer the taste of Coke? I have to question the legitimacy of that taste test. You may have read in the Typhoon liner notes that I've broadened my palate and am now really into Arizona Green Tea with ginseng and honey, but Coke still rocks! Now that Tea In The Typhoon has been released, what lies ahead in 2010? There are plans underway to do some dates with my band including something at the renowned Baked Potato jazz club in L.A. I definitely would like to keep investing in that side of what I do. I am also taking steps to get my clinic schedule notched back up a bit. Things slowed down substantially over the past few years due to schedule craziness from both Linc's Today Is The Day and my Tea In The Typhoon recording projects. The clinics are a great opportunity for me to play some of the Typhoon material live. I will continue to record and tour with Lincoln Brewster which will definitely fill a fair amount of my calendar. We're currently working on his next studio project, and Fall 2010 should be fairly busy with roadwork to support the release.